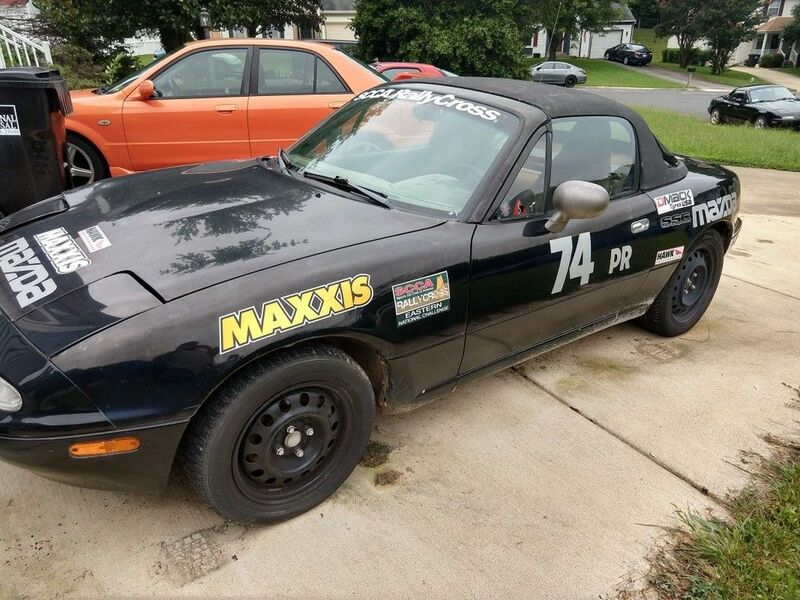 Last night moxnix posted this ad to sell his 1994 Miata. Against my better judgment I actually browsed the classifieds this morning. For a weird variety of reasons that I'll get into later this all seemed like a great idea at 7:50 am while drinking my first cup of coffee. In the last 11 hours I've agreed to purchase the car, moxnix and Patrick have figured out how to get it to Patrick so he can play with it and throw some new rubber on it, Pete Gossett has generously offered to sell me a very reasonably priced rust free flood car shell, and Spacecadet decided to be my partner in crime in these shenanigans. Some of you might remember that I don't like Miatas. I spent time with a very nice Mazdaspeed car that a friend left with me for a while while he was moving. I fixed the crank nose and resealed Spacecadets car last spring and drove it around for a bit to test it. I love to autocross and rallycross them, but for the most part I like them best when someone else owns them. Every time I talk about how I don't like them Keith Tanner shows up and tells me that they're completely different cars with a hard top, and this car has a hard top. I'm going to give Miata love one more chance. This is going to be so much fun, I need to fix one little nagging issue on my 99 Miata and i'm going to put it up for sale. I’m going to throw plates on it and hoon the berkeley out of it. You know, just to make sure it’ll make the trip to Texas. Of course. Italian tune up, that sort of thing. Completely necessary. Talked to spacecadet this morning and I think we have a basic plan. It's gong to be a no rulebook do it all car. AC and enough sound deadening to make it fairly pleasant to drive. Roll bar, six point belts and decent seats for HANS use. Rallycros? Sure! Autocross? Any and all. Fresh brake fluid and head off to a track weekend. Get a crazy idea and go to Miatas at Laguna Seca. Hit a Grid Life or two. Everything. Low power, narrow tires, reliable and be able to do it all with some level of competence and all the safety. We're both excited. 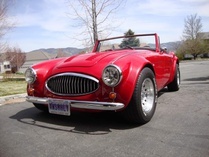 If it's the hardtop aspect you're really looking for, you can pull the soft top non-destructively in about a half hour. Gives you a bunch of room on the back deck and makes it a lot easier to install a roll bar. The Mazda M Coupe showcar has a little bar that runs from side to side to restrain stuff back there. This 94 has a less fancy thing that will do it as well. Also, make sure it's properly adjusted so it doesn't creak or rattle. Not my first choice of suspension. Unless they've changed their spring rates, you'll want to put on a big fat front sway bar and loads of front camber to keep the back end behind the front. It already has a racing beat solid front bar and koni shocks with coilover sleeves. I'd probably stick with that over the Spax. you don't want 17's for this car, do you? 100% on you. I even used you when I told my wife that I bought the car. "Keith told me I would like a hard top car". You can ask her. The plan for now is to see how it sits, how it drives, and go from there. Probably a rear bar for balance on the grippy stuff, but we're not planning to make a high grip car which should keep the suspension fairly sane. Keith is going to teach me how to make it quiet and comfortable, just you watch. Probably not? 17 inch tires are expensive and expensive is bad. We're going old school with this. That's the plan anyway. More helps on making it quiet and comfortable, now that I appear to be committed - once you've pulled that top out, lift the carpet up and put some sound insulation under the carpet and the rear deck. Not Dynamat style, but something that's specifically to limit sound transmission. The stuff I've had good luck with is almost a felt made of chopped up denim. I really need to sell something just so Seth can buy it from me. Me thinks Seth has sold something lately to make these shenanigans R(63)EAL......either that or Mrs.Seth is truly one in a million. I'll be asking a lot about making a hardtop car a good place to be when this car gets home and I can drink coffee and poke around. I do love driving Miatas in anger but when I've had them before I have to make myself drive them at regular car times. The easy button is to make sure the car is in spacecadets driveway and let that be his problem, but he's sitting on a pretty darn nice NB that he's not driving for similar reasons. Considering we've both owned the same STS Civic and both sold it because it sucked at car stuff, we're pretty close on what we feel a car needs to do to be part of the fleet. This would be second, or ninth car for either of us so it will have a bit of leeway, but I don't want to own any car that sits because I don't want to drive it. That's really the great crux of this experiment. Building a car that can perform without beating up the driver is my favorite. Definitely talk to me. This all the way, the 99 is a great car, but has not fit my life the way it used to with the Focus now in my life. The Focus works for me at autocross in a way the NB does not. My NB is too nice to destroy at RallyX, because Seth and I discussed that last week while I was at Solo nationals. It needs some love and I'm going to put up at a price for sale that should be more than aggressive enough to move it very quickly. not a bad car, just not what I need anymore. It's a well built E street autocross car and I don't need 2 Autocross street class rulebook cars. Seth, this is what I have under my Miata. If I had to do it again, I wouldn't change a thing. It's just a fantastic car to live with and drive. It's easily daily driver quality. Those old fogeys on the Miata forum boards are right, the lighweight wheels make a huge difference on these cars. As Jeremy Clarkson would say. "The car is just brilliant". I was about ready to sell my Miata until I got the hardtop. I'm looking forward to this also as I daily mine.